Most computer users know that they can take a screenshot of the screen with a tap on the print key on their keyboard. And while that's sometimes all they need, it is often not the most comfortable or practicable solution. This is especially true if you only need a screenshot of a program window or part of the desktop. With print, you'd have to load the screenshot in an image editor to cut, edit and save it before you can add it to your content. 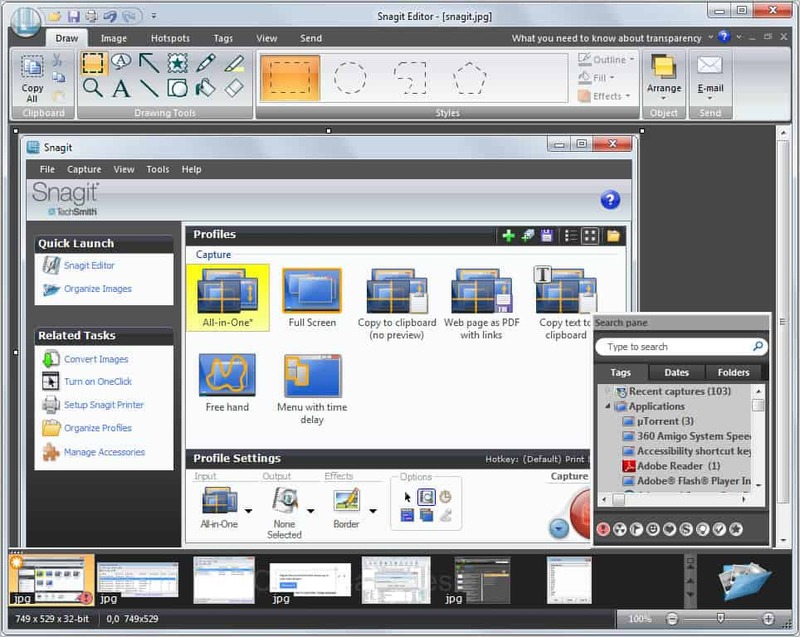 Screen capturing applications like SnagIt improve the process significantly. The program hijacks the print key functionality to provide users with powerful screen taking options. It is still possible to take a screenshot of the whole page, but also of a single window, a region on the screen, free hand, of scrolling windows or menus that are often hard to capture due to their auto closing. But SnagIt's functionality does not end here. Techsmith have added text and video capturing capabilities and many specialized modes and options to the program as well. All-in-one is the main screenshot taking mode as it allows you to take all kinds of screenshots without switching to a specific capturing profile. You can use it to capture the whole screen, a window or a region. Sometimes though you may want to switch to another capturing mode which you can do in the main program window. You can pick a mode from the profiles offered in the main interface, or from the Input dropdown menu presented under Profile Settings. Specialized modes, for instance to capture DirectX, full screen DOS or custom scrolling regions are available for selection. Output settings, effects and options are configured here as well. You can save screenshots directly to the system or on an ftp server, send it to the printer, attach it to an email, save it in the Clipboard or open it in the built-in editor. Effects let you add borders, edge effects, captions or watermarks, or change the screenshot's dpi settings. Options finally can be used to hide or display the mouse cursor on the screen, configure timed captures or preview the image in the editor. New capturing profiles can be saved in the program. They appear under Profiles for quick selection. Once configured, you take screenshots as fast as you would with the operating system's default print key feature. Snagit Editor can be used to edit screenshots before they are saved to the system. The program supports basic image editing options that include cropping, resizing or cutting images, adding text or lines, but also specialized options that are highly useful in regards to screenshots. These include highlighting screen areas, blurring information, adding watermarks, and effects like shadows or borders. SnagIt keeps track of all screenshots automatically in a library as long as they are not deleted on the system. This combined with the program's tagging improves the manageability of past screenshots. The programs functionality does not end here though. You can install so called accessories that add functionality to the program. Accessories are available to instantly push screenshots to WordPress, Moveable Type or Type Pad blogs, to Skype, Flickr or Microsoft Office documents to optimize the workflow further. 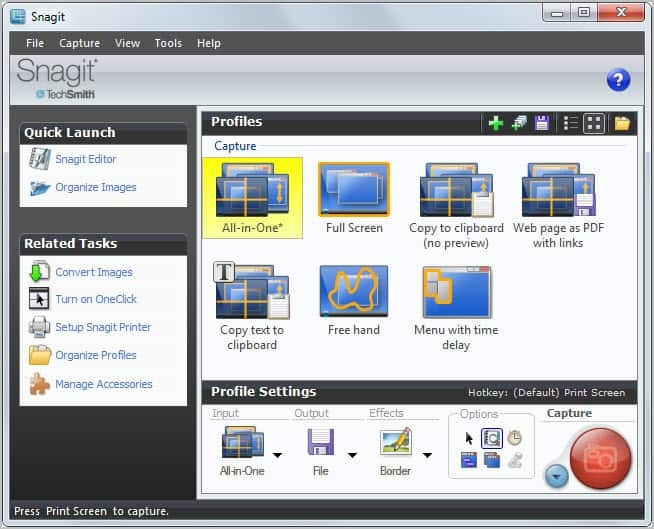 SnagIt supports three additional capturing options. Text capture works like an OCR tool that reads text displayed in images or dialog boxes into text that you can copy and paste. Web Capture allows you to capture all images that are displayed on a web page. You do however need to input the url directly to use the feature. Video capture finally can be used to record screen activities. This is more or less a lightweight version of Techsmith's Camtasia screen recording and production software. The module can record a single window, a region on the screen, or all of the desktop. It is optionally possible to include audio and the cursor movement in the video. Videos can only be saved as avi files. Camtasia Studio is to video recording what SnagIt is to screen capturing. The program is an all-in-one solution for all video capturing needs on the desktop. It supports recording video and audio off the screen. Options are provided to create full screen recordings, recordings of individual windows, regions of the screen or directly from a connected web cam. 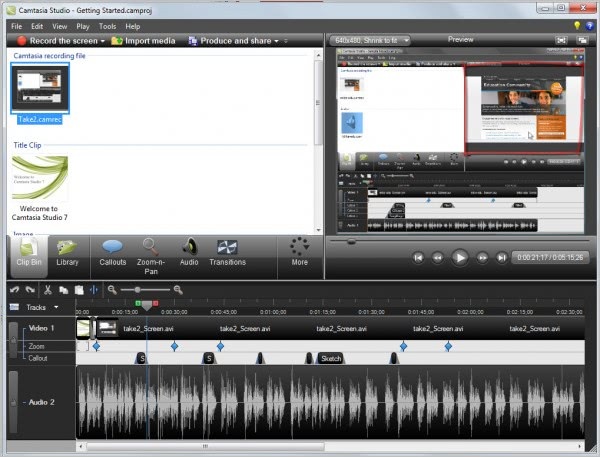 Camtasia Recorder is the small frontend program that you can use to start captures with a single-click of the mouse. The most important configuration options are listed in the program window. You can select the video and audio source, and configure the recordings in detail. One interesting option is the lock to application feature. This basically links a window to the recording with the effect that recording dimensions are automatically applied to the window (the window is automatically resized by Camtasia). That's useful if you want to record in a specific resolution. Recorded videos are played in a preview window automatically once the capturing is stopped. Here it is possible to delete the video, save it as an avi file directly or send it to Camtasia Studio. You can change the editing dimensions on the first screen in Camtasia Studio or keep the original size of the recording. Once done you can start editing and producing the video. This includes adding additional clips to the video, cutting or splitting videos, adding callouts that highlight areas in the video, or making changes to the audio recording (volume leveling, voice optimization). Additional features allow you to add captions, use the picture in picture option to display a smaller video in the video that you have recorded, record audio, transition effects, and to add title clips to the video. Especially the option to record audio directly from within the editor is useful for users who like to create screencasts or tutorial videos. Instead of having to talk and demonstrate at the same time, it is now possible to capture the video first, and add the audio later on in the processing phase. Record - Create video recordings of the screen, or part of it. SmartFocus - Keeps track of the action on the screen. Speech to text feature to add captioning automatically. Option to import or export captioning files. Videos can be saved in various formats. Camtasia Studio supports saving videos for Blogs, YouTube, HD and DVD and mobile devices such as iPhones. Presets can be edited or created, which works similar to SnagIts profile feature. Camtasia MenuMaker can be used to create menus to launch created videos automatically. This can be handy for video DVDs for instance. Camtasia Theater finally allows you to combine multiple Camtasia Studio produced Flash files into a single web menu. SnagIt is a professional screen capturing software that leaves little to be desired. Workflows can be automated and optimized to an extend that the majority of comparable tools do not support. Camtasia Studio can be used to create professional video screencasts, tutorials and demonstrations, and handles everything from the first second of recording to editing and production. Both programs, despite their professional grade functionality, are easy to use and handle. Techsmith offers video instructions on their website for both programs. Unrestricted 30-day trial versions are available for both programs on the developer website. We have 4 SnagIt licenses and 2 Camtasia Studio licenses for this giveaway. Leave a comment below and let us know what you like to do with the programs if you win a license. Winners are then drawn from all comments. After switching from “screenshot documentation” to “screenvideo documentation” for all my software installations and server configurations I am using Camstudio for this purpose -but it lacks of some functions and sometimes crashes so that I have to restart again … Would really like to try an alternative! I wish I could get Camtasia Studio. I think of creating videos of my own photoshop tutorials. It would be great for presentation as well. I’d love to start recording video reviews of various games and apps. Both tools are very useful. I would use SnagIt for tracing online purchase, making a snapshot for each step. Camtasia Studio would be useful to capture hard to download videos. Count me in for both. Thanks. i’d like tu use camtasia as a tutorial maker, actually i’m making endless powerpoint presentation as tutorial (as asked) and i’m not pleased with that. I’d like to be in the draw for Snagit please. Thank you. As a active student learning programming I will use Camtasia to make video tutorial for my college as it’s better than making PDF or PowerPoint presentation. Camtasia Studio interest me alot. For general screenshotting, I feel more confortable with free screeenshot captor from donation coders. I really love this program and I think Camtasia the best of its kind. Very conveniently, efficiently and without brakes. Huge amount of processing capacity ( effects, increase, work with audio track, output in different formats with different resolutions, and much more…). Really wonderful program from talented programmers. Thanks for this really GREAT giveaway and for the chance to win! Thanks! I will make some programming tutorials for my students. I have volunteered to do screencasts for the ABP addon. In case you think i am lying !! Martin, can i have the giveaway, please ? The last time I use it during my evaluation period is impressive, and I still remember it been quite some time ago. Hopefully they are even more new feature added to it in their latest version so hopefully if I able to win myself a license here I could play around with it. Anyway thank once again to Ghack for another brilliant giveaway. Please count me in I wouldn’t mind winning any each of this both are fantastic application and useful for me to do review on my site. Sometimes I need a screen recording hard to get, and people around says Camtasia is the best for this task. I have tried numerous print screen programs over the years and just one program does not seem to do everything I want. I’ve used Gadwin, Any Capture, and many others as I search for a complete print screen program. In my profession as a mariner it is so much easier to put together a tutorial to train people than it is to wait for them to figure it out themselves. A picture is worth a thousand words, a print screen is worth a thousand pictures! It is also quicker and makes my request more clear when I can forward a webpage or part of a webpage when I am looking for parts and supplies for my work, or try to explain to others how I intend on using the parts I have purchased. I have used Snagit and found it very complete and user friendly. I have only used Camtasia on rare occasions, but remember it to be quite impressive also. I am hoping to “capture” at least one of these, I know it can only be an improvement over what I am now using. Wow I can’t believe my eye, it’s Camtasia!! I love this software a lot no doubt it is the best screen recording application in the market. I used it before and you know what, I love its ability which allow us to make video and insert and edit stuff easily. I can attach my favorite audio file to the captured video because I am not the guy who speak while making my video for tutorial. Thank again for this giveaway you guy are really awesome and please have a blissful Christmas ahead! Oh good luck too to all the participant. (Could be a nice Christmas gift to me if I were to won one of these ) xD. Excellent software I would like to win. I’m still using old versions of SnagIt and HyperSnap and would love to win a new(er) license of SnagIt. I’m working on creating my blog where I wish to incorporate some videos and screen shots. Camtasia will help me create the videos with the ability to dub the audio separately by using a better voice. I also like the facility of having a video in the video. Will be great to experiment with. Snagit will be especially useful to push screenshots to WordPress and I wish to see how the Text & Web Capture works. Great products both and therefore an excellent giveaway, but sadly only too few licenses for so many fans. Thank you and best of luck to everybody. SnagIt and Camtasia Studio = excellent softwares. I would have used these program to create presentations, video review and tutorials. Thanks for the giveaway. Count me in for both the applications. Snagit cane be used for screen capturing. I can use it for preparing computer troubleshooting documents. Camtasia studio also can be used for recording computer troubleshooting videos. In the next few months, I will be starting some tutorials for clients. Both of these products would come in very handy. I always wanted do some WordPress tutorials but with the freely available tools they looked not the way that I wanted to publish them. Camtasia Studio would be a great tool to create *good* screencasts. I regularly create CBTs and other training material for kids, and these tools will really help me do this task easily. …and I could have use for both of these… so please count me in for this giveaway! thx for the giveaway of v.10, with so many new Features. I am a blogger who writes articles about software, SnagIt is the most useful program that really helps me to take scrrenshot and make notes on them. I do video processing and repairing computers. I dream of making your video course entirely dedicated to work with computer. I use the various free software and demo versions.Of course I would like to work with professional software. Such as Camtasia. Thank you for this another really great giveaway and for the chance to win a license!!! I use SnagIt (an older version) all. the. time. at work. Having a personal license would help me out in my freelance stuff. Both are great software from techsmith.I haven’t yet used camtasia studio but since i have got a net connection at my home,would definitely try to make some tutorial and share with friends.As far as snag it is concerned i have used it and find it very useful with lot of feature but had some problem when capturing a long scroll windows.It fails sometimes with long scroll windows and also during scrolling both horizontal and vertical scroll.I do regular visit their home site to check new version.They haven’t released new one since long time.Would love to win license. Great software and great contest everyday. I think Snagit would be really good for helping me with presentations and tutorials for my computer user groups. I usually use some freeware or open source utilities to accomplish these tasks, but think Snagit should be better. Camtasia Studio would be nice also, maybe I can start recording some presentations or tutorials, rather than just using slide shows. I would appreciate either, should I be a winner, and would write a review for computer user group newsletters also. Keep up the good work, have Ghacks in Google Reader and Google+ to keep track of posts. Very nice… I’d like to win a license for Camtasia Studio so I could start making some tutorials for my mom. Thanks! Would love Camtasia Studio to make tutorials and guides for software. Constantly trying to tell people how to use software and I could just show them with this! My friends and colleagues considere I’m an advanced PC user; so every time an issue occurs – they just call me to give some help. Unfortunatelly, there are large distances between my home and any of theirs. Delivering short tutorials showing how to fix the problems should save some of my precious time (and money for gasoline as well :) ). Camtasia/SnagIt made tutorials. I have been a longtime user of Snagit, but haven’t been able to upgrade since version 7. I would love a new version. It is invaluable when it comes to creating user documentation. Thanks to Ghacks for the opportunity to win this great software. Count me in for Snagit, please. I would help my wife to make Photoshop tutorials for her paper crafting business. She uses Photoshop to make different sentiments for her cards and would like to share the steps with her followers. Definitely a nice Christmas gift! I’m still using old versions of SnagIt and HyperSnap DX and not in a position to upgrade due to financial reasons. I would really love to have a license of either of one software. With new features, these will help me improve my productivity. Please count me in. Snagit is an amazing product. I have an older version and it makes my computing life so much easier. I “grab the screen” to create product documentation, to snag interesting photos, to save screen shots when I purchase a product on-line… etc… I have not had a chance to use Camtasia Studio, but I am sure it is an equally amazing product. Thanks for the opportunity to win one of these fine products ! I could really use Snagit as I lost my last screen capture program (Screen Presso) to a computer crash and the free program I downloaded last week is not very capable. I wouldn’t mind winning SnagIt. It’s really useful for me at work, so it would be nice to have at home for quick screenshots. Camtasia is GREAT software for video editing. and also for recording, for tutorials ,etc. with alot features on camtasia studio also. I can do anything for great result. I Love it, i’d love to get one license for camtasia. Count me in for Camtasia studio ,please. thanks gHacks for giveaway ,also GREAT review with great software. I would give the Camtasia license to my friend in Florida that teaches high school Math. He wants to make video lessons to put on school website. The educational pricing is still too much for them to afford. I am also using a older version of Snagit. I would love to get the update. I manage to use it throughout my work week on various projects. Cheers. Camtasia Studio is one of the best applications for recording what happens on the computer screen, built-in editor helps you to easily create high-quality video. This is ideal program for my YouTube channel. Thanks for the great Giveaway! I train X-ray service engineers and am continuously developing training materials using screen captures and videos. I’ve yet to find software within my budget that is easy to use and produces professional-looking results. I’m currently using a combination of Greenshot and iPhotoDraw for screen capturing and editing. It would be wonderful to use Snagit and have both functions integrated into one package. I’ve tried CamStudio and really couldn’t get the hang of it. I’m using Microsoft Expression now but that really isn’t working out for me either. I could really use Camtasia Studio. Please enter me in the drawing for both Snagit and Camtasia Studio! I will be using for snapshots and video making if i win. Hope I will end my loosing spree here with this giveaway. Salvete! I have commented in these contests before but I never win anything. I guess that means I am a loser! Anyway, I use Screenshot captor, and really like it, but I am commenting in hopes of winning the Camtasia Studio, for part of my work has to do with creating video tutorials. I have been using wink, but it is rather limited, and doesn’t seem to have much hope for improvement. Anyway, I hope I win! Haven’t tried Camtasia, but sure could have used it to capture the video of my nephew’s graduation ceremony posted online by his university. I’ll think of wonderful things to do with Snagit + Camtasia. Too good! I want win a license. Snagit: This would be invaluable to me for performing screen captures at work and annotating them! I have heard about this being the premier screen capture tool on the market and would love a copy! At present I use Screenshot Captor but would really love a copy of this software! I really would get so much use out of it. Please enter me in the draw! Cheers and thanks for organising this promotion. I have used the program before and it rocks! Camtasia Studio: this would be invaluable to me to make a recording of internal work systems that I have to explain to colleagues and people who work for me. It would be invaluable to leave someone a video explanation of how to use a company system instead of having them ask me a thousand times. I would really love a copy of this software too. I can see the best applications have been left until last – thanks so much for setting up the give-away and for not making people who enter the draw jump through a thousand hoops to enter like some other tech blogs that shall remain nameless! Outstanding software–would love to own the titles. Hands down Camtasia Studio is the ultimate screen recorder software. I would like to use it to launch my second career producing tutorials. Please count me in Dear Martin. I really like using these two software especially to make the print-screen mode become more live and fun. I need this software to create video tutorials. I would use all its features. Is the best program, for capture. Great Graphics utility. I’d like to record “how-to” videos for family so I can send them to friends and family to fix common computer problems. I will be making some programming tutorials for my family & friends. Thank you the giveaway Martin. I would really like to upgrade to SnagIt and/or Camtasia from my current freeware solutions, which I use to make tech tutorials for the teachers at my school. As campus Tech Coordinator, having either program would simplify my workflow. I cant find out or Camtasia Studio is only for a 32 bit o.s. system? Can Camstasio studio also work with it with a 64 bit o.s. system? Paulus, Camtasia Studio worked fine on my 64-bit version of Windows 7. I was using an old version of Snagit until my computer died three years ago. Since then I have been using different screen capture programs and all the while reading about the new functions being introduced in successive versions of Snagit. Being retired and on fixed income I would be very happy to get a free license for Snagit as a Christmas present. I will be making some tutorials. If I won this application, you’d use it as soon as I could the best, because I once saw this application and I was very pleasantly surprised, because this application is equal terribly dear who is called a program such as Adobe Premiere, and one word I can not afford this way the application, and I would like to learn this type of program, as fascinated with the video processing, so as I was elected, I would have developed in this type of specialization. I’m really a professional remodeler but I have a tech geeky side too. I’m always taking screen shots when I submits bug reports and such (Yes, I’m a ‘squeaky wheel) Snag it would be excellent with the enhanced capabilities. Camtasia – One of those little things to send ‘how to’ videos to my ‘computer challenged’ relatives and friends. I’m starting up a local .NET user group and would like to be able to produce training/demo videos for our group. I’ve tried using Jing and it is nice but 5 minutes goes by *very* fast. I use an old version of snagit and camtasia and would be proud to have the new ones. For screenshots I use the portable FastStone Capture. Camtasia Studio I really need! Count me! SnagIt and Camtasia Studio are truly in different class when it comes to taking some good and classy interacting screenshot and screen-recording respectively.Thanks Martin and TechSmith for the giveaway. Camtasia is a very famous software, I would like to have it… I will use it as a support tool. Hi! To capture a screenshot and video I use free software. Programs SnagIt and Camtasia Studio and I’m very like it, but I can not purchase them. And when I learned that you have held a rally of the programs I was very happy to get their opportunities. I hope to get lucky. I’ve always found Snagit to be an amazingly efficient and useful application. As I web designer, I need to take screenshots in various forms (sectional, fullscreen, scrolling) just to share with clients and collaborate with partners. And I always tell others to pick it up because it lets them easily comment, crop and add arrows when they need to point something out to me. Count me in for the Camtasia Studio giveaway. This is a great app to create training material! I LOVE Snag it for capturing screen shots for tutorials, Powerpoint presentations and user manuals we use at our office. I don’t have Camtasia studio but would love to have it. I use Jing! to record short tutorials for our office and my blog and it is awesome. I can only imagine how wonderful Camtasia is. Every Techsmith product I have tried I have loved! Highly recommend them! If you are in any way involved in the business of explaining things — and that includes more of us than we usually realize — then these two software applications are must-haves. Great products, great support from TechSmith! Thank you for the giveaway! I need SnagIt for creating tutorials for my work! There are some alternatives but I like SnagIt a lot. It is one of the most powerful screen capturing applications. Hi, this is a awesome giveaway. I would like to win a license for Camtasia so that I can improve my videos. I make tutorial videos on how to fix the basic windows problems for users and some on programming and Camtasia would be a great tool to add effects, edit the videos more easily and to make them look more professional. I own the applications already, but I wish everyone I know could have a copy–so I would likely give my winnings away. Snagit and Camtasia Studio are immensely helpful in creating screencasts and videos–they make the instruction clearer and more efficient. Great stuff! “Save videos in different formats and for different platforms” +”Save videos in different formats and for different platforms”. A teacher’s dream come true, only if I have “free” copy. I think – There are a lot of progrmas like this but Snagit is the best! When I win I will be using it all the time. I often have to do screenshot to my work education etc. Most important – screenshot with auto roll. Thanks for great giveaway. Thanks for the opportunity to win such great software. personnel. I believe that these are both very good products. I could see Camtasia Studio being used a lot for me. Between recording lectures, tutorial videos for my colleagues, and many other uses for students outside the classroom and professional development. Love it! I would love to have Camtasia as it is an incredible program that would really help me create and produce some technology training videos for my campus. It’s a long time I need a good screen capture software! I wrote some tutorials (help on using some software) using screen captures and text. However they lack dynamics of showing simple actions instead of writing long texts to explain. I only tried CamStudio a bit but didn’t feel confortable with it. Someone in the office used an old version of Camtasia and recommended it. I would like to try my luck with Camtasia Studio. I’ve used Camtasia before and loved it to pieces. I would really like to have my own copy to use. I teach so having this software would help me setup some good instructional and how-to videos for my classes. I could also see myself using Snagit to create how-to hand-outs. Both apps are excellent, but i prefer Camtasia Studio, because I make many app reviews and screen recording software is very useful for me. If I won a Camtasia license I would use it to make video tutorials for Ableton Live, my favorite music-making software which I have used for almost 10 years now. My partner uses Camtasia at work to create online learning programs and she loves it. Camtasia Studio is a relatively inexpensive and yet very powerful tool for creating any kind of demonstration presentations and training. The program allows you to capture the content of what is happening on your desktop (or part thereof) with voice-over to your video. The captured material can then freely edit, enrich the so-called hints. balloon, or add text information. Thus prepared, the material can be easily published in multiple formats: AVI, MP4, Macromedia Flash (SWF), Windows Media (WMV), QuickTime (MOV), RealMedia (RM), Animated GIF, as well as executable file (EXE) . These program have great reputations and I could reap a lot of benefits from them. Thanks Martin for this JumbO giveaway. I have to regularly work with both screenshots/tutorial making/ LMS stuff / video training, etc…and my experience says that nothing could beat Snagit & Camtasia. Therefore, Please count me in for both Snagit & Camtasia (Windows version). Wow – fantastic giveaways. I have used both of these progs, and love them. With Snagit, I love the ability to be able to do a range of editing with effects within the program. Camtasia is beautifully simple and I am able to upload directly online. I would love to win either one of these, so please count me in! Thank you! Sometimes I have to make some short tutorial for the volunteer organization I work with and for some friends. So these two programs could be really useful for me. Please count me in the contest. I have been wanting snagit for a long time. I use windows snipping tool for taking pictures of quotes on websites, and order numbers. Thanks a lot Martin for the giveaway is i win one i will camtasia to record my tutorials and snagit for my blog. I volunteer at a local seniors’ centre as a computer mentor for a program that we started at the beginning of this year. I did a major amount of the work preparing tip sheets for the curriculum that we are covering. Since nearly 50% of our students are beginners who have never even typed having good instructions is critical. Since I don’t have a great deal of experience, capturing screen images was extremely difficult resulting in my limited use of images. I would love to be able to redo these tip sheets and add screen shots so our students would be able to double check what they were doing. I would, therefore, greatly appreciate a licence to Snagit. Fantastic program. Would love to have a copy. Thanks. Terrific! This is a big catch you made Martin. Thanks for this very nice opportunity. Both tools are the best in its class and are well-known, so there isn’t many to say. I would use Snagit for study and all-day snaging around. Cause today it’s essential to have always a tool by hand to capture & collect interesting content, highlight & annotate important parts for better understanding and reuse in documents or presentations. Therefore I really like the idea of one easy workflow (snag – edit – save&share) and its easy tools to finalize snapshots fast. I would also use its timestamp functionality to record some core steps for shoppings and registrations. This is sometimes important if you use coupons over here. Camtasia Studio would also arrive at the right moment for me. Cause at my mum’s work they recently upgraded os, office- and other software to new versions and as common these days they didn’t get any trainings for that. So she has many questions and looking for answers. But sometimes it’s hard to find a free timeslot where we both has time or the right tool. Camtasia Studio would eliminate both problems and would help me out. I really would love it to win one of these gems and I think I would dance around christmas tree if it would be Camtasia Studio. I need the camtasia, i always need to get through videos in my profession but sometime just want getting parts of them but cant managed to do it without the any software. Being a final year students i have to capture lot of screenshot of my project. This will definitely ease my job. Would love to get the licence on these amazing software. I am using Snag-It Version 8 bought from retail computer store. It’s great. Use it a lot to capture scrolling web screens of software reviews. So if latest Snag-It version is given, will use it for the same. I use Cam Studio (freeware) to capture videos of other people’s travel movies that they upload on the web. It is well known that CamTasia Studio is a pretty good video screen recorder/demonstration video producer. Camtasia and Snagit are both useful and good programs for screen capture work. So I want to have the license. Snagit seems to be best to be used for screen capturing and Camtasia for recording computer troubleshooting videos. PLEASE: put my name in the pot for this software (BOTH)! I would love to have these as an upgrade to my current setup. Excellent products! Perfect for creating procedures at work. I can put either one of these products to use for that purpose! Thanks for this Giveaway.Please count me in.I want Snagit.I am a student whenever i surf i always seek for important data,bookmark a page is not the solution as i always have to turn on the net for viewing it so snagit helps me by capturing the snapshots of the pages that i want.Hope i win. I’d love a copy of SnagIt. I use it at work and it is invaluable for recording the error messages that users get and then can’t remember. I have tried the trial version to record videos for presentation in my work and find it really useful. Camtasia is a great screen recording software. I love Camtasia they are 2 excellent software i wish i gill get the licese keys but good luck everyone. Would love to have a license for Snagit or Camtasia Studio. Allows me to create wonderful presentations for tutorials. Anything educational related. What I like with Snagit is creating a profile for your screenshot needs. Its speed-up your task in switching every profile and then edit with the editor, it so simple. And also, what I like with Camtasia Studio is the ability to have a speech to text function so you don[t worry putting caption in some parts of the video. I help blind and deaf kids and adults and people who are homeless and people who are starving and unwanted and also ppl who are marginally maligned and as well as the unwashed and unwanted citizens of the world. Mother Theresa left a huge burden on my shoulders. If chosen, I will make use of the programs in my online college course! Bloody computer problems, I hope I’m not too late. This is amazing software and would be really useful in my everyday computer needs. I’d really like to have a license. Fantastic program. I’ll take one please :) Thanks. I use Camtasia Studio at work. I tried several free products including CamStudio & BB FlashBack but Camtasia is tops which is why my company bought it. Easy to use with excellent results. If I win this I’ll use it for personal stuff at home to create how-to vids for friends, etc. Best software for capturing desktops, useful for creating tutorials on YouTube. Good luck to all! I use an older version of this app and love it. An upgraded version would be just awesome! Thank you. Please count me in! SNAGIT The ONE and ultimate screen capturing software.Provide wide range of capture techniques. the best on are combine image features and markup tools. tagging etc. New text caPture and format and effects are work like ease. IF I WIN IT I WILL CAPTURE ONLINE PHOTOS, SCREENSHOTS, MAKE DEMOS, IT WILL BE FUN RATHER THAN DOWNLOADING. Camtasia has Good UI with proper arrangements of options, Provide great flexibility while editing video, adding callouts etc.The best part is its output quality. IF I WIN I WIN IT WILL BE GREAT FUN CAPTURING ONLINE VIDEO, UPLOADING YOUTUBE VIDEO, WILL CAPTURE ONLINE AND RECORDS. I would be glad to participate in the giveaway draw – I can make great elearning products with Camtasia. I still use version 7.2.5 of GrabIt for integrating manuals and user guides and I hope to win version 10!!! This is top-notch software that I’ve never been able to afford. I have used the trials and am blown away with them! I would love either one and thanks for the opportunity! SnagIt and Camtasia are wonderful tools that can be used in online learning and eCommerce. I would be interested in using these tools for educational purposes. I think it is great this site is offering a giveaway! Hopefully, I will be one of the people selected. Good luck everyone! I have used Techsmith programs for years and they are always ahead of their competition. And, their support and newsletters are tops. I could use both of these programs in my teaching endeavors. Happy holidays. My mother died on 4/17/2012. I am in the process of making a video compilation of every single frame I have of her since she was my best friend and I miss her dearly. The videos are the last thing I am able to hold on to. 30 days is just not enough time and I do not have enough money to purchase the full version. If I had the full version, I could finish my project. Great program. The best. Would recommend to everyone! I have used Snagit in previous company’s Work for, it is ideal for creating training materials, cheat sheets, record training that can be view by other users as a resource. If i win a license it would make my work a lot easier, since the company i work for is giving me issue to purchase a license for me. Settings – Network & Internet – Data Usage – Usage details. Based on your now old but still useful review, I used the currently available free 15 day trial of Snagit by Techsmith to easily capture the scrollable output of my internet usage. I had hoped to find a built-in Win10 AE solution, but so far no luck.